You know the saying, “A few bad apples spoil the bunch”? This applies to couponing as well. A local grocery store in my area will not accept printed coupons because they were a victim of coupon fraud. Most couponers are ethical, but this one instance ruined it for all us honest folks in my area. It’s very frustrating because I lose out on many good deals because I can’t use my coupons at that location. I get it though. They are trying to protect themselves. By now, you’ve no doubt heard about coupon fraud, but do you know what it is? If not, you should learn since it affects every single couponer. Coupon fraud is when a person knowingly uses a coupon against the store’s coupon policy and the coupons terms. How can this be done? There are many ways to commit coupon fraud, but some examples might be using the coupon on an item not listed, using a counterfeit coupon or using it after its expiration date. Coupon fraud is not only unethical, but it’s illegal as well. If you’re caught committing coupon fraud, you could be fined up to several hundred thousand dollars and possibly do jail time. Coupon fraud is the same as theft so they are punished a lot alike. Counterfeiting coupons is just as bad and is looked at much like counterfeiting money is. Why is it bad for couponers? 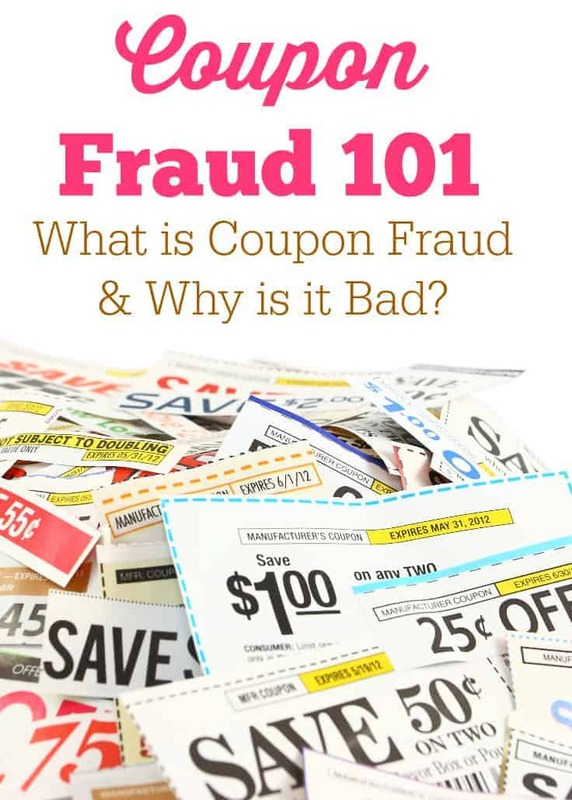 Now that you know what coupon fraud is, can you figure out why it’s bad for all couponers? Imagine that a store receives 1500 coupons for $1.00 off that are all redeemed fraudulently. The manufacturer refuses to honor them causing the store to lose out on $1500.00. Now imagine that happening five or six times. What does the store do? Continue to lose out on money? No, they won’t do that. Instead, they will tighten their coupon policies to place stricter restrictions on coupon usage or just refuse to accept coupons any longer. When this happens, it puts a squeeze on all couponers who shop at that store. Coupons become harder to redeem, coupon limits get smaller, and stores stop stocking as many items that typically carry coupons. By committing coupon fraud, you are stealing not only money from the stores, but if you got the product for free, you are stealing the item as well. There really isn’t a need to commit fraud when using your coupons. There will always be another deal and the next one will most likely be just as good as this one. Couponing ethically will always save you more money in the long run…and you’ll avoid a possible jail sentence and hefty fine. Say NO to coupon fraud! Be ethical in your transactions and show stores that people who use coupons can be trusted. Were you aware of coupon fraud before reading this post? The Honey Girls Debut in Canada! I can’t believe that this is even an issue….some people eh. Love it when I get high value coupons and FPC’s and I’d hate to see them limited because some folks can’t help themselves…. Yes, I have heard of coupon fraud. But couponing is not as good as it used to be because a lot of stores put tons of restrictions on coupons, and it is not worth haggling with them over coupons. I use coupons, but not as much as I used to! Nowadays you have the cashback apps….and there is fraud being committed with them now as well. this problem could be minimized if food manufacturers stick to proper coupons or take charge of the industry and develop an app to replace coupons all together. I hate print at home coupons with a passion. I think this is sad and pathetic, but greed consumes many people. I think eventually internet printable coupons will disappear all together. I don’t print any coupons unless they are high value. A lot of places won’t take them anyway. Sobeys is my closest supermarket and they are very picky. I try to avoid using coupons there. Purina Cat Chow Pet Perks here in the USA had to discontinue having a coupon for a free bag as one of their rewards because of rampant coupon fraud. Thanks, fraudsters. You ruined things for everyone. How sad that some people decided to commit fraud and ruined it for so many other honest people just trying to make ends meet. I understand the reluctance on the part of the stores, however, think it is too bad that this decades old practice has become so suspect. no Safeway store in our city will take any outside coupons – just their own. sure is frustrating. I love using coupons but completely understand the issue from a business perspective. Couponing is so helpful. It’s a huge undertaking, responsibility, and privilege. It’s sad when like you said, “a few bad apples…” I’m sorry that this happens, and I’ve heard of it before. Sad. I have tried basic couponing before. I miss it. I used to save a bit here and there. I don’t print coupons as I’d rather get them from the Sunday paper. Its pure greed that wrecks couponing for the rest of us, I don’t print unless it is a high coupon.